A new report from The Wall Street Journal suggests that Apple will abandon its proprietary Lightning port later this year, instead opting for a USB-C connection for charging and wired syncing. For a company that has recently doubled down on Lightning, that seems unlikely. Here's why. 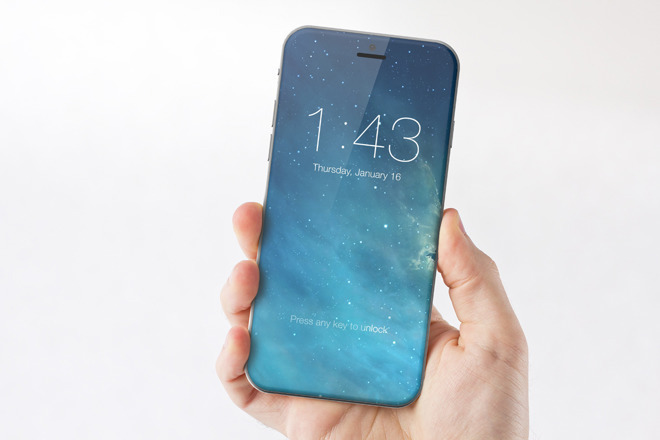 Citing people familiar wth production of the upcoming handset, the Journal reported on Tuesday many of the aspects already expected of Apple's so-called "iPhone 8," headlined by a curved OLED display provided from Samsung. Consistent with earlier rumors, it was said that Apple plans to launch three new iPhones this year, with a high-end flagship model sporting a new look and new display technology. But in a twist, the report also claimed that Apple will use a USB-C port for the power cord "and other peripherals," implying it will ditch the Lightning connector that has been a part of Apple's handsets since the iPhone 5. Apple will introduce other updates including a USB-C port for the power cord and other peripheral devices instead of the company's original Lightning connector. Rather than move away from Lightning, Apple has continued to introduce new accessories with the proprietary connector, including the Apple Pencil, Apple TV Siri Remote, AirPods, BeatsX headphones and more. The continued expansion of Lightning —including full-fledged USB 3 speeds beginning with the 12.9-inch iPad Pro— along with negligible gains over the switch to a physically-similar USB-C port, would call the rumor into question. Instead, it's more likely that Apple might switch to a USB-C connector on the opposite end of the Lightning cable that ships in the box. That would allow users to plug their "iPhone 8" into one of the company's new MacBook Pros, or the 12-inch MacBook. Apple already sells a Lightning to USB-C cable separately for those instances. Shipping one in the box would prevent users from turning to legacy wall adapters with full-size USB ports, but limiting the USB-C cable to the high-end "iPhone 8" —which is rumored to carry a price tag above $1,000— could potentially ease the transition to a new port. Notably, Tuesday's rumor made no mention of wireless charging on the "iPhone 8." Apple is widely expected to offer contact-based wireless charging on the rear glass case of its flagship handset, allowing users to juice the device by simply placing it on a compatible charging pad. Another key change in this year's handset is expected to be a new FaceTime camera capable of 3D facial recognition, allowing for a new secure biometric login method. The Journal's report made no mention of this improvement either. It did, however, reiterate that the "iPhone 8" is expected to ditch the physical phone button that has been found on all iPhones to date. 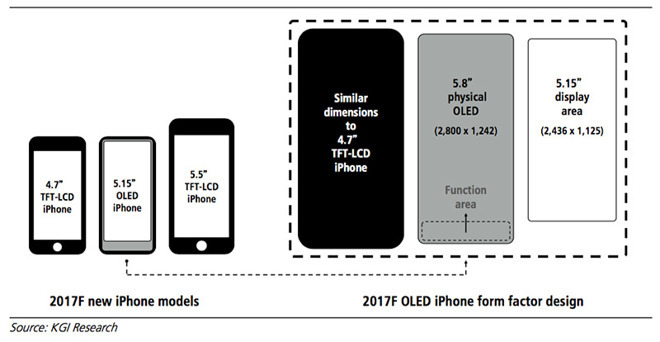 It's expected that Apple will switch to a new "function area" below the OLED panel, dedicated to system functions like virtual buttons. Apple already laid the groundwork for a virtual home button beginning with last year's iPhone 7 series. The button employs the company's "Taptic Engine" haptic feedback technology, simulating the feeling of a click without the button physically moving. The Cupertino, Calif., company is believed to launch all three new iPhones— an "8," a "7s" and a "7s Plus"— in its usual September timeframe. The "iPhone 7s" series is rumored to feature largely the same design and form factor as the current iPhone 7 series, allowing the premium "iPhone 8" design to stand out.